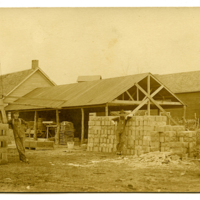 Concrete block manufacturing plant located on east side of Main Street immediately north of the railroad. It also served as a carpenter shop, and was operated by Fred and Frank Lyons (brothers) Owners: Ralph Lyons. 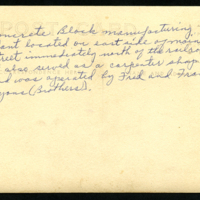 unknown, “Lyons concrete block manufacturing,” Hesston Public Library, accessed April 19, 2019, https://hesston.digitalsckls.info/item/1369.